If you ever swerve through traffic jam on a track bike you can't help to notice the tight geometry brings instant feedback and pure excitement: that's the reason some people stick to their track bikes for daily use. Add brakes as safety features and a good track bike will instantly become great urban assault weapon. Mohammad Kemal is really proud of his Columbus SL/SP-tubed, '80s Colnago Super Pista. During a couple years of ownership, he ride this bike not only on daily basis but also on long distance, fixed-gear-only touring. He's not really into period-correct, purist build: all he need is selected components to work flawlessly and providing him with great ride as shown with this bike. As you might noticed, most track bikes doesn't have provisions to install brakes. After recently obtaining a pair of drilled, non-aero Campagnolo Victory brakelevers Kemal decided to put them on his Super Pista. No big deal, since the bike is already equipped with front brake through Dia Compe brake mounts. The problem arises when he wanted to mount both brakelevers to maintain symmetry, so we need to put rear brake as well. After some tinkering, we have them sorted. Little details does count: even the cable clamps are Campagnolos. One thing worth noticing in this bike is the rear wheel. It's made of Campagnolo Record Pista single-sided hub, Nisi clincher rim, and 40 (count 'em, fourty!) 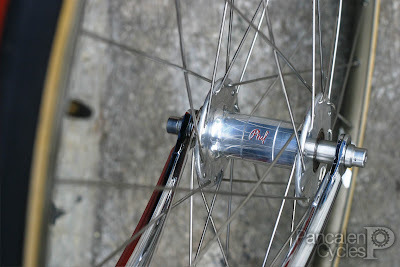 Wheelsmith double-butted spokes. 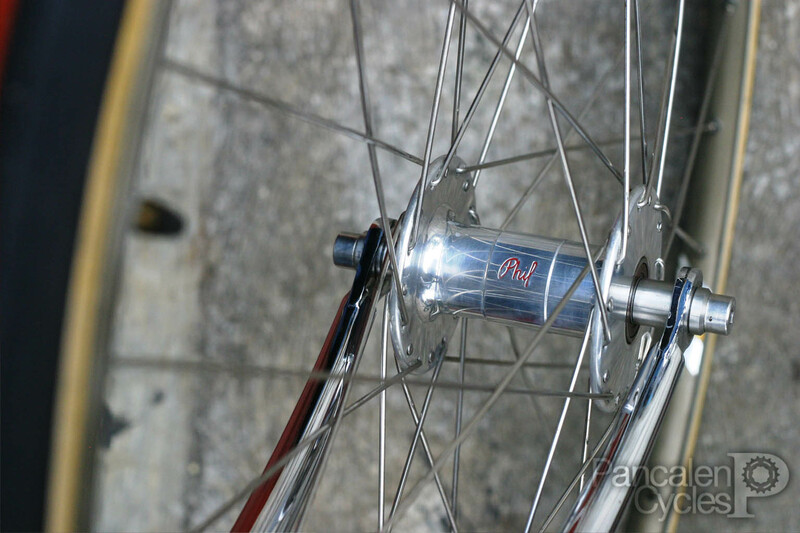 The front wheel is Campagnolo Omega tubular rim laced to 32-holed Phil Wood track hub.